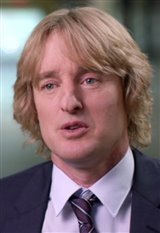 A native of Dallas, Texas, Owen Wilson's career in film started when he signed up for a playwriting class in college. There, he met classmate Wes Anderson. Together, they wrote an eight minute short called Bottle Rocket , which Anderson directed and Wilson, along with his brother Luke, starred in, with middle brother Andrew also playing a role. Although they hadn't studied acting, Owen and Luke played two slightly misguided friends who rob one friend's house as practice for a later bookstore heist, then go on the lam. It eventually caught the attention of Polly Platt, a producer who worked for Gracie Films, the production company headed by James L. Brooks. After meeting with Wilson and Anderson, Brooks agreed to produce the film and Bottle Rocket became a full-length feature, winning a Lone Star Film Award for Debut of the Year for Luke, Owen and Anderson. Although the movie failed to make a profit, it enjoyed a cult following, particularly due to the Wilson brothers' onscreen charm. Owen began to appear in small roles in films -- first The Cable Guy , followed by Anaconda . Two more supporting roles followed, as a member of Bruce Willis' crew in Armageddon and as Ben Stiller's drug-addled friend in permanent midnight . Wilson and Anderson collaborated again in 1998 with Rushmore , the critically acclaimed comedy about a precocious teenage boy whose grades are terrible even though his school spirit is high. Wilson also appeared in The Haunting as a member of a group chasing ghosts. He gave a breakthrough performance as a mild-mannered serial killer in Hampton Fancher's The Minus Man . Next, Wilson co-starred with Jackie Chan in the physical comedy Shanghai Noon (2000), and the movie was such a big hit that it spawned a sequel called Shanghai Knights (2003). In Meet the Parents (2000), Wilson once more worked with Ben Stiller, and they would team up yet again in The Royal Tenenbaums (2001), written by Wilson and Anderson, for which they earned their first Oscar® and BAFTA nominations for Best Screenplay. His wages on the action drama Behind Enemy Lines (2001) were a paltry $3 million, but Wilson was content to take a break from comedy and show his ability as a dramatic actor. In the hit film Starsky & Hutch (2004), an action comedy based on the popular drama series of the 1970s, Wilson played health nut Ken Hutchinson while Stiller played Dave Starsky. For his work on Starsky & Hutch and the huge hit comedy Wedding Crashers (2005), his salary rose to $10,000 per film. Wilson fell in love with his You, Me and Dupree (2006) co-star, Kate Hudson, and the two began dating after finishing the movie, but they split in June 2007. Two months later, Wilson was rushed to the hospital following a suicide attempt. After recuperating, he returned to work with films such as Marley & Me (2008), Night at the Museum: Battle of the Smithsonian (2009) and How Do You Know (2010). In recent years he appeared in She's Funny That Way (2015), No Escape (2015), Zoolander 2 (2016), and Masterminds (2016). In 2017, he starred alongside Ed Helms in the comedy Bastards, reprised his role as Lightning McQueen in Cars 3 , worked alongside Julia Roberts in the drama Wonder and comey Father Figures (2017). Justin Bieber murdered in new Zoolander 2 trailer premiere!